A colourful tapestry that captures the events of the Royal Burgh of Renfrew is set to take pride of place at the town’s major shopping mall. The Renfrew 600 Tapestry was created by residents in 1997 to commemorate 600 years of Renfrew as a Royal Burgh – and is now destined to be displayed at intu Braehead. 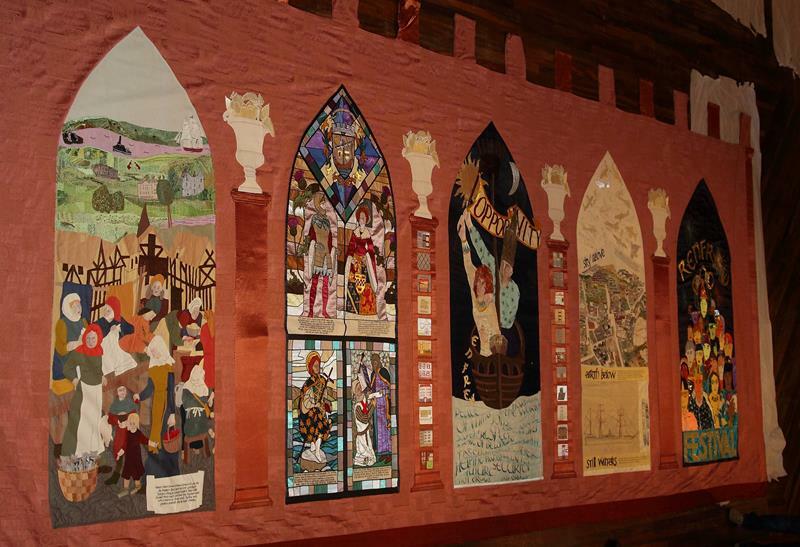 The 18 year old tapestry reflects events of Renfrew from 1397 when it became a Royal Burgh and was originally hung in the main hall of Renfrew Town Hall. However there was no suitable location in the town hall after its refurb and the tapestry has been in Council storage since Renfrew Town Hall’s development. Renfrewshire Council’s Finance and Resources Policy Board this week gave the go-ahead for £15,140 from the Renfrew Common Good Fund to meet the cost of a suitable protective case for the tapestry and its re-location. Jim Gamble from Renfrew Community Council said: “This is excellent news for the community of Renfrew that the tapestry will now have a permanent home where it can be seen by the many thousands who pass through Braehead on a daily basis. The tapestry will be situated in the link corridor between the upper mall and the blue multi-storey car park. It’s hoped re-location will be complete nearer the end of 2015.